3 Flautas on corn tortillas, choice of chicken or beef. Served deep fried with cheese, guacamole, sour cream, lettuce and tomato. & choice of beef or chicken, guacamole, sour cream, lettuce and tomato. Includes 3 corn tortillas, choice of cheese & onion; bean, cheese & onion; or choice of ground beef, chicken or pork, which includes cheese & onion. Beef tripe served with 3 corn or flour tortillas, lemon, onions & oregano. Rice and beans not included. Chunky beef cooked in Mexican gravy. Includes corn or flour tortillas. Chunky Pork cooked in Mexican gravy. Includes corn or flour tortillas. 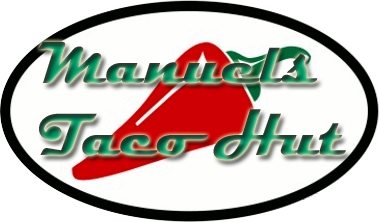 Combination of chunky beef, ground beef, and pork, cooked with Manuel’s special spices. Includes corn or flour tortillas. Includes corn or flour tortillas. Lightly breaded deep-fried steak or chicken breast with avocado & lemon slices.Includes corn or flour tortillas. Steak served with our special sauce. Includes corn or flour tortillas. Served in our Mexican sauce with lemon slices. Includes corn or flour tortillas. Choice of chicken, Chorizo (Mexican sausage) & egg, or steak. Served with rice and beans. 1 taco, 1 tostada, 1 enchilada, 1 burrito. Includes choice of ground beef, chicken, or pork and cheese. Includes choice of flour or corn taco. an enchilada on flour or corn tortilla with cheese and onion. of ground beef or chicken with sour cream and guacamole. Served with green peppers, onions, tomatoes, and lemon slices.